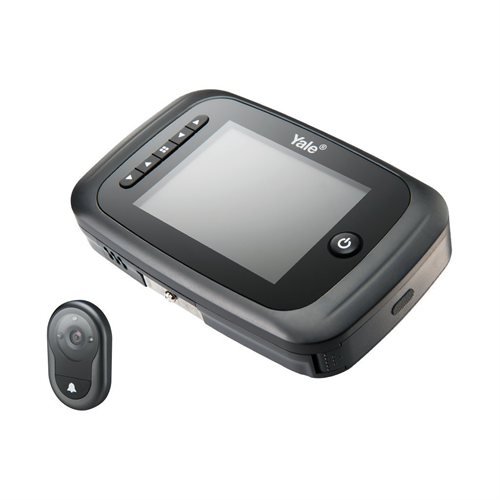 The AYRD-DDV7001-693 premium digital door viewer from Yale lets homeowners to be able to answer their doors in a new and innovative way. The viewer comes with a 3.2” LCD screen and a wide angle lens (105 degrees), which allows for clear images on screen without the distortion created in traditional door viewers. This is the black coloured variant, the silver is also available on the Aartech Canada website. Installing the viewer is easy and it will fit most standard doors with a 1.5” to 2.5” thickness and a peephole size of 0.55”. If the hole is smaller, as may be the case with older doors, it may need to be expanded to accommodate. The viewer comes with an internal memory that can hold up to 50 images that are time and date stamped to show if any visitors were missed. This time can be expanded by adding a micro SD card. A picture is also taken each time the button on the system is pushed. The camera’s 3 infrared LED’s allow for ease of operating during the night and making sure that surveillance is continued on your property’s door even then.